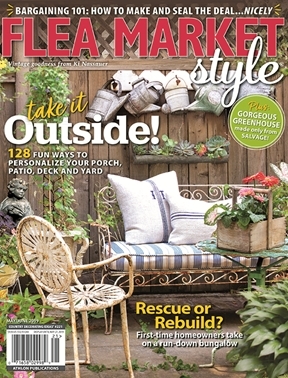 Find hundreds of ideas and inspiration for indoors and out in the May/June 2019 issue of Flea Market Style. Here’s a glimpse of an issue you won’t want to miss! Vintage lives outdoors beautifully, as three homeowners with to-die-for retreats, gardens and yards show. See a she-shed made from salvaged windows and a reclaimed brick path leading to cozy sitting areas. Plus, try the fab ideas from “The Antique Gardener.” Among them: old funnels as hanging flower baskets and a trellis made in minutes from three long-handled tools. It’s flea market season, and we’ve got you covered! Get tips for choosing the right cart to ease your shopping and learn tricks for negotiating a deal. Plus, readers chime in on what they love about the favorite flea markets. You have to see the “before” photos to appreciate how a down-and-out Washington bungalow regained its vintage charm, thanks to a young couple who saw the potential. Plus, tour two other homes that will make your vintage heart swoon. Get crafty! You’ll love our ideas for turning scavenged wood napkin rings into bud vases and more. Also see how to create “hankielopes” from vintage handkerchiefs. As always, have fun guessing the UFOs (that’s Flea Market Style lingo for unidentified flea objects), meet our Vintage Crushes, hit the road with us for a vintage shopping day trip and check out our state-by-state list of flea markets.